There’s always something. You go through the writing process, get everything done and uploaded and ready for sale, and then there’s always something that has to be fixed. You know, that one little spelling error you missed. Or a page layout issue that just didn’t sit right with you. Or maybe the image on the cover really needs a slight adjustment. The things that wake you up in the middle of the night after a book launch, and have you scrambling out of bed to get it fixed in a hurry, because you won’t be able to sleep until it’s done. That didn’t happen when I released the Matchmakers trilogy. I was so excited about that one, so eager to get it released, that for the first time, I actually slept easily the night after launch. I stumbled across a bad review of Second Chances, the first book in the trilogy. A lot of it I just brushed off as personal taste, but the reviewer did point out one thing that had completely slipped my mind. The stories take place in a fictional world, and since all my writing takes place in that fictional world, it never occurred to me that the m/m audience, as opposed to my general fantasy audience, wouldn’t immediately realize that the books took place in a fictional world. Then another reviewer pointed it out (pre-review, thank you Isa! ), and I realized how stupid I’d been. I’m just so wrapped up in this fictional world that it never occurred to me my readers might not be so. I live and eat and breathe the Shifting Isles, so I forget that there’s an actual reality out there sometimes. So, yeah, my mistake. Entirely my fault. I should have thought of that. I’ve corrected it now, adding a note before the text to clarify that the stories do not take place in the real world, that there are multiple gods, that the days of the week have different names, etc. All the little things that were throwing readers. What can I say? Live and learn. Fix your mistakes. And move on to the next thing. EEEEE! 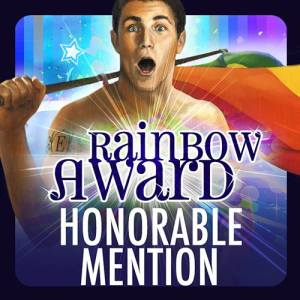 The Matchmakers Trilogy received Honorable Mention in the Rainbow Awards! Looool! Love your post if you want a laugh I even googled the days of the week to see if they were in another language never imagine they were in another world!